Dahlings, strewth. 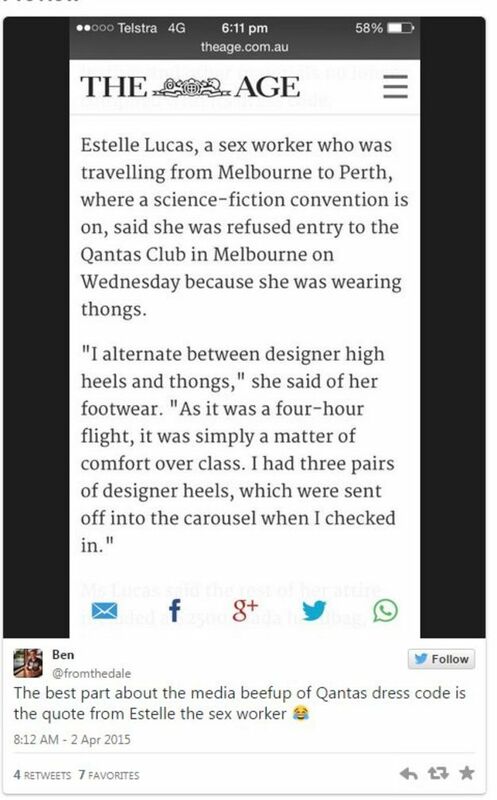 Seems like those Aussies are chundering over Qantas’ decision to have a ‘smart casual’ dress code for it’s business and club lounges. “Singlets, bare feet, rubber thongs and clothing with offensive images or slogans are, in most cases, likely to be deemed unacceptable,” said Qantas. Bloody Hell. I never thought I’d see this from a country as laid back as the Aussies. The best response is by Estelle Lucas. However, the policy is not being applied everywhere especially Darwin, the capital of the Northern Territory. Apparently not too many suits in desert.